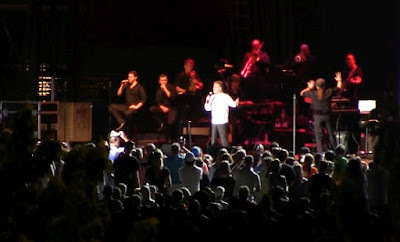 LoessFest Lip Sync Lollapalooza: AKSARBENT saw Frankie Valli in CB! LoessFest brought Frankie Valli to Council Bluffs, IA along with whatever incarnation of the frequently-reconstituted Four Seasons is currently shaking. Nobody with any sense believes that Valli isn't lip synching these days. There's even a clip on YouTube of Valli's digital helper going into a loop and of him finally walking off stage—no one, apparently, could shut the thing off. Sure, but what year did he sing those notes?" We came to see tweaked arrangements of our Top 40 faves and were not disappointed. Live (the backup Four Seasons replicants were live, anyway) the Four Seasons' evergreens are fresh and just as infectiousness as the first versions. Whoever tastefully re-arranged these hits absolutely know what s/he was doing. In fact, the original Sherry recording would be improved by the exquisite accent of the brief a Capella harmony in the opening bars of the live performance. The live version of Stay now includes a wild jazzy instrumental passage that is terrific. Mr. Crewe was gay, and his brother, his only survivor, said he was discreet about his sexuality in many of his social circles. He noted that in “Jersey Boys” Mr. Crewe was portrayed as overtly gay, but in real life that was not the case, Mr. Newman said, particularly during the period when he was working with the Four Seasons. Promotional material for Dynovoice Records quoted a female singer fawning over Mr. Crewe’s handsomeness. “Whenever he met someone, he would go into what I always called his John Wayne mode, this extreme machoism,” Dan Crewe said. 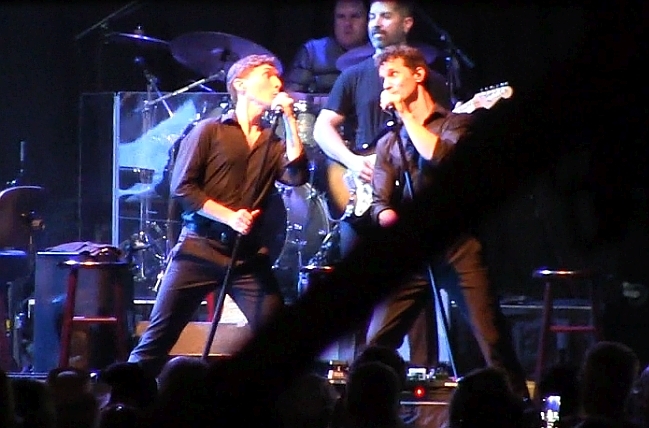 Crewe, reputedly, was not happy about being stereotyped in Jersey Boys by the authors of the musical's book, Marshall Brickman and Rick Elice, or having director Clint Eastwood extend the caricature in the movie version, which probably needed something festive since Eastwood's cameras sucked most of the energy out of a very lively theatrical play. The last time Clint had anything to do with a musical was in 1969 when, as an actor, he made Paint Your Wagon. His big number was I Talk to the Trees. Roger Ebert called it whining, not singing, but we like Eastwood's not-terrible-at-all rendition. Octogenarian Eastwood no longer talks to trees of course, just an empty chair at the occasional GOP Convention. As for queening up Crewe, we're not sympathetic to false characterizations by cynical writers who sell the prejudices of a patronizing audience back to them for fun and profit. Neither do we have a surplus of empathy for Crewe, who died, dementia-riddled, in 2014. ...Who needs the truth? Feed 'em lies. They're all hungry for alibis. When it's easier to protest? Beggars Parade never became a hit and isn't performed by Valli, so our reverse-karaoke experience was not ruined and we didn't have to throw fruit at the stage to register our political disapproval. Instead, we had a good time and TOOK PICTURES! Only the guy on the left looks like he could be from Jersey. You! 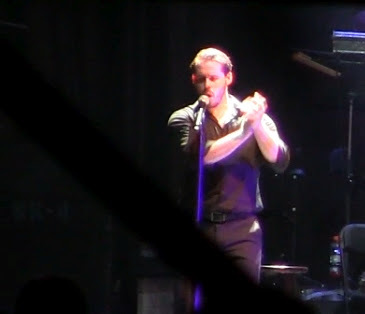 Hand claps! No 60's hit recording worth anything lacks them!